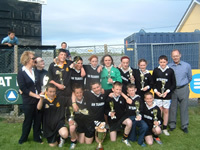 Bhí dhá chomórtas ann arís i 2005, A agus B. I gcomórtas A bhí Leitir Mealláin, Tír an Fhia, Trá Bháin agus An Tuairín A. I gcomórtas B bhí An Cnoc/An Druim , Leitir Móir, Leitir Caladh agus An Tuairín B. Tar éis an-choibhlint sna cluichí sraithe bhí an cluiche ceannais B idir na comharsan Leitir Móir agus Leitir Caladh. Fuair Leitir Móir an ceann is fearr le cúilín amháin agus bronnadh Corn Chuimhneacháin Jimmy Rua Mac Cormaic orthu. Sa gcluiche ceannais A d'imir An Trá Bháin an An Tuairín A agus don dara bliain as a chéile bhí an lá ag An Tuairín A agus Corn an tAthair Ó Faoláin ag dul soir thar an Daingin arís.